I love it when someone asks me, “What should we do for [insert meal or culinary occasion here],” because there’s not much I would rather do than think about food, think about preparing food, and then think about using my prepared food to give others a nudge toward incorporating more of a plant-based diet into their lives. There are so many misconceptions about pure vegetarianism that when I first began, even I wondered if by adopting this diet, I was making a decision to give up certain foods I’ve always enjoyed — especially sweet breakfast foods like baked goods, French Toast and pancakes that call for eggs, milk and butter. But the good news is: you don’t need to give them up or compromise taste. A few simple substitutions will give you the same delicious results you’ve always enjoyed, minus the animal-derived ingredients. For Memorial Day weekend, a friend and I thought it would be fun to have a great pure veg Sunday breakfast before heading out to the park to lounge in the sun and read books all day. What did I decide to make? Pancakes, of course. Prepare the “buttermilk”: Pour the soy or rice milk into a small bowl. Add vinegar and whisk. Set aside for a few minutes to curdle. Prepare the batter: In a medium bowl, sift together the flour, baking soda and salt. In a large bowl, whisk together the soymilk/vinegar mixture, Earth Balance and soy yogurt. Add the dry ingredients to the wet ingredients and stir until just combined. Use a wire whisk to help break up any lumps that may form. Cook the pancakes: Heat a griddle or cast-iron skillet that has been sprayed lightly with cooking spray. For each pancake, gently spread about ¼ cup of the batter on the hot surface to form a circle. Cook over medium-low heat until the top is set, about 2 minutes. Flip the pancakes and continue cooking until golden, about 1 to 1 ½ minutes more. Transfer to a large plate and keep warm while you cook the remaining pancakes. Divide the pancakes among plates and garnish with fresh, sliced strawberries. 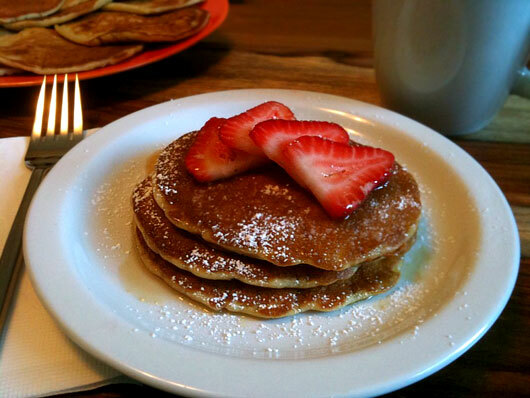 Drizzle maple syrup over pancakes and strawberries, and sift a spoonful of confectioner’s sugar over top. Serve immediately. Tips: Using sweetened soymilk and vanilla soy yogurt will add a touch of sweetness to the pancakes without adding sugar to the recipe. To eliminate sugar from your batter entirely, use unsweetened soymilk and plain soy yogurt. The above recipe is one I've kept around for a while and love to use particularly to wow omnivorous friends, adapted from Food & Wine magazine.